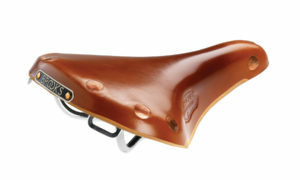 A classic Brooks saddle designed for the sporting female cyclist. The Team Professional S and the Finesse are the ladies versions of the many Team Professionals. These ladies saddles are manufactured with traditional chromium plated steel rails, with copper plated steel rails and titanium rails. The ladies model with titanium underpinnings is entitled Finesse. The Team Professional is a classic Brooks saddle created with the needs of the sporting cyclist in mind. This model has been in production for half a century, originating from the old B17 Competition. This saddle is a pleasingly simple design, which truly deserves the description ‘timeless classic’. The title Team Professional is embossed on either side just above a precisely hand skived stripe along the side edges, where a little of the glossy leather top surface is removed to reveal the texture and lighter tone of the suede beneath. Large headed copper rivets are hammered by hand, providing the finishing touch.